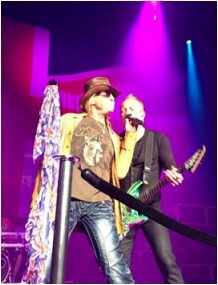 Def Leppard played the 9th show of the 2013 VIVA Hysteria! residency last night at The Joint in Las Vegas, NV with 22 songs played. Show number 9 saw the band play another 8 song opening set as "Ded Flatbird". The set order was mixed up again with only two songs remaining from show 8. 'Promises' and 'Wasted' were played again with 'High 'n' Dry' album favourite 'Mirror, Mirror' back in alongside 'Rock! Rock!'. The 10th show takes place tomorrow night. Return of the Live Blogs? - Yes.